Storm D. Floyd, owner of Amazing Eyes Optical Boutique, earned his American Board of Opticianry Certification in 1997. He has worked for Lenscrafters in Dallas, Texas and Mobile, Alabama as a Frame Specialist and Certified Optician. He also worked for Bay Eyes Spectacular in Foley, Alabama as a Certified Optician as well as the Surfacing Lab Manager. Storm D. Floyd, ABOC officially opened Amazing Eyes Optical Boutique in spring 2007 in Foley, Alabama. As the backbone to the business, Storm oversees all of the daily operations and operates the lab. His high service standards, product standards and process standards exemplify the superior expectations of Amazing Eyes. He regularly attends conferences and lectures to stay educated on any and all changes in the optical industry. 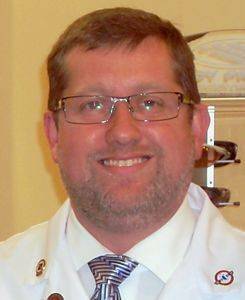 Mr. Floyd is a past board member of the Alabama Society of Dispensing Opticians, the president of the Mississippi Association of Dispensing Opticians, and a member of Opticians Association of America. His special interests are spending time with his family and attending college football games.